Hello everyone, this is Khalid Moammer, Senior Editor – Hardware. Before we get into the content of this article I wanted to mention that it’s a special one. It’s the very first guest written article by one of our own WCCF readers and the very first of a new initiative that we’ll be kicking off today called WCCF Podium. WCCF Podium is all about giving you, our readers, the chance to make yourselves heard on a much larger stage. Starting today each and everyone of you will have the chance to have your own stories featured on WCCF. All you need to do is submit your article via email to tip@wccftech.com. We will personally review each submission. At the moment we will only accept submissions on topics related to PC hardware. The article can be of any length, additionally we will reserve the right to edit your content for clarity. We will not consider article ideas, but only finished write-ups. Prospective authors are required to disclose any potential conflict of interest beforehand. If your article is selected, your work will be published under your name. For each article you will be given the opportunity to introduce yourself via an opening paragraph if you choose to take it. Our first WCCF Podium feature is from Oldmoe a Wccftech reader and a hardware enthusiast. 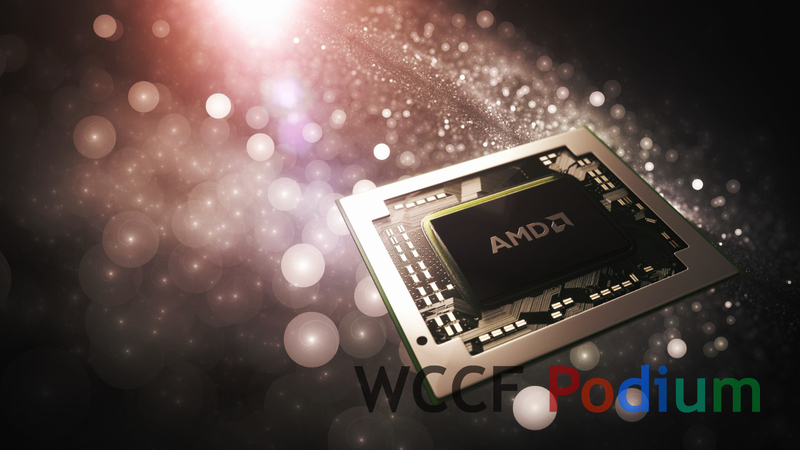 Stoney Ridge is AMD’s new low power, low cost, mobile computing line. It succeeds Carrizo-L and is supposed to share the socket with AMD’s higher end Bristol Ridge much like Carrizo-L shared the same socket with Carrizo. Unlike Carrizo-L which is based on the low power cat cores (4 Puma+ cores) Stoney Ridge is using the bigger architecture and employs the construction cores instead. It uses the latest iteration of the construction cores (Excavator) which was first used in the Carrizo line. Though it is rumored that Stoney Ridge is using a slightly improved version of the core (Excavator+). What we know about Stoney Ridge is that it uses a single Excavator module, which means two cores. It also has three Radeon clusters (192 stream processors) and a single 64bit DDR3/4 memory controller. From a CPU performance point of view, Stoney Ridge presents a departure from the typical AMD low end APU designs. Where due to the characteristics of the cat cores the x86 performance was heavily weighed towards multi-threaded performance at the expense of single threaded. In Stoney Ridge, however, the use of XV cores allows the APU to scale its single threaded performance much higher than any previous low end APU from AMD. Though due to the fact that there is only a single XV module, multi-threaded performance is expected to regress, specially in FP workloads. It is also worth mentioning that it is due to the multitude of power saving features that went into the XV design AMD was finally able to scale its more powerful cores down to the low power low value segment. With APUs expected to have as low as 6 watts of TDP. S1 2 1.1/2.9/3.5GHZ 192 600MHZ 15W? S2 2 1.1/2.4/2.8GHZ 192 500MHZ ??? S3 2 1.0/2.0/2.2GHZ 192 400MHZ 6W? The first sample seems like the flagship Stoney Ridge mobile part, already known to operate at 15W. The other two parts are lower bins, the third sample is almost surely the 6W variant, while it remains to be seen whether the second sample is 6W or 15W or something in between. Intel’s low end line is composed of two radically different core designs, three of the above SKUs come with the Skylake core while the other two are Atom Airmont cores. 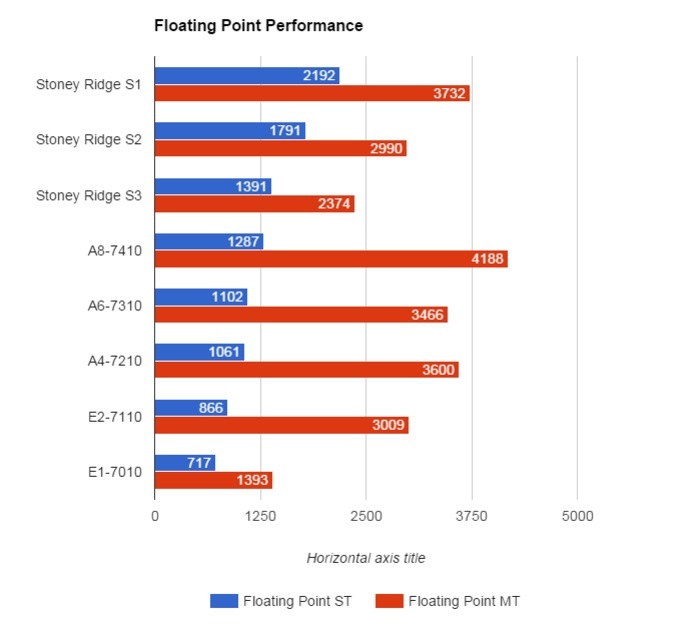 With the Skylake variants sporting only two cores versus four for the Airmont ones. Skylake cores are much faster than the Airmont cores, thus Skylake based cpus provide much higher single threaded performance, multi-threaded performance is a mixed bag though, due to core count. Now that we laid out the various contenders, let’s have a look at how the Stoney Ridge samples perform versus the previous generation and the current competition in the market. GeekBench 3 has three different components of testing, it tests Integer, Floating Point and Memory performance of a certain chip. In both single and multi-threaded operation. Here we will present the data for Integer and FP results and compare the different APUs/CPUs to each other in that regard. Here we see Stoney Ridge samples, even the slowest one of the, edging out all Carrizo-L parts in single threaded integer performance, with a very healthy margin. Thanks to Stoney’s much higher clock speeds and stronger IPC. Carrizo-L is able to strike back in multi-threaded performance. We see a similar story in FP performance. Stoney parts leading the way in single threaded performance and losing that lead in multi-threaded tests. It is clear that AMD’s design decisions for this generation focused more on improving the single threaded performance as much as the construction cores allow in such a TDP limited range. Now let’s see how Stoney Ridge compares to the currently available competition. Mainly Skylake and Airmont parts that occupy the same low end, low power segments. Here we see that the Stoney Ridge variants offer very competitive single threaded integer performance. In fact, the top end Stoney Ridge is faster than any other APU/CPU in that chart. It is over 60% faster than the previous Carrizo-L top SKU (the A8 7410) and is over 17% faster than the fastest Skylake Pentium in ST Integer. The last generation AMD E2 APU comes last. In multi-threaded integer performance things change though. The A8 7410 and the Pentium 4405U top the chart and they lead the top SR SKU by less than 12%. The SR SKU 1 leads all other APUs/CPUs by a large margin. The celeron finishes last in this test. 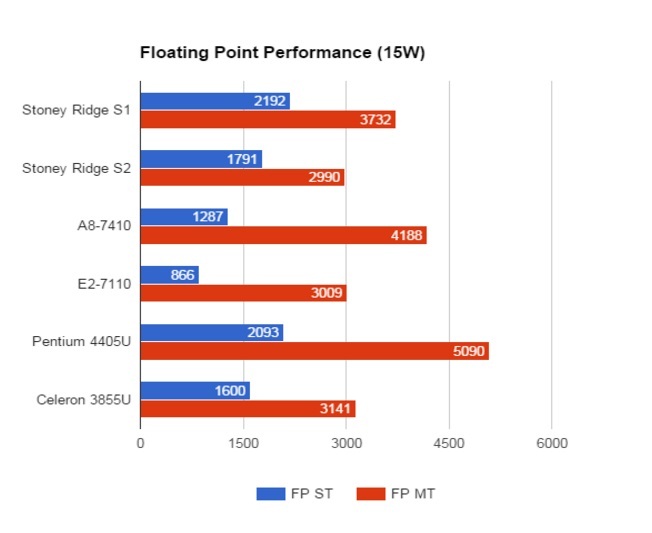 For single threaded floating point performance we see the Stoney Ridge APU maintaining its lead, thanks to the 3.5GHZ clock speed. It is 70% faster than the previous generation (A8 7410) though just under 5% faster than the Pentium 4405U. The E2 is again the slowest in ST performance. The reversal in multi-threaded performance is a bit more aggressive than the Integer tests. Thanks to the single floating point unit that is shared by the two cores of the Stanley Ridge APUs. 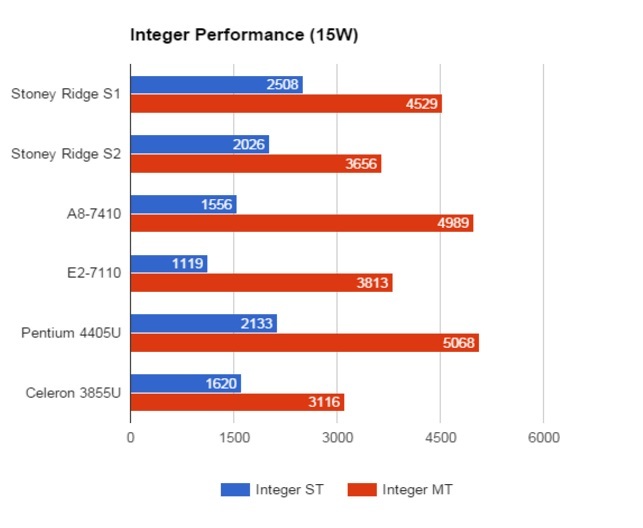 The Pentium 4405U takes a comfortable lead and is over 36% faster than Stoney Ridge, while the last generation Carrizo-L is over 12% faster than Stoney Ridge. The Celeron manages to nudge through the E2 in this test, securing the last position for the latter. 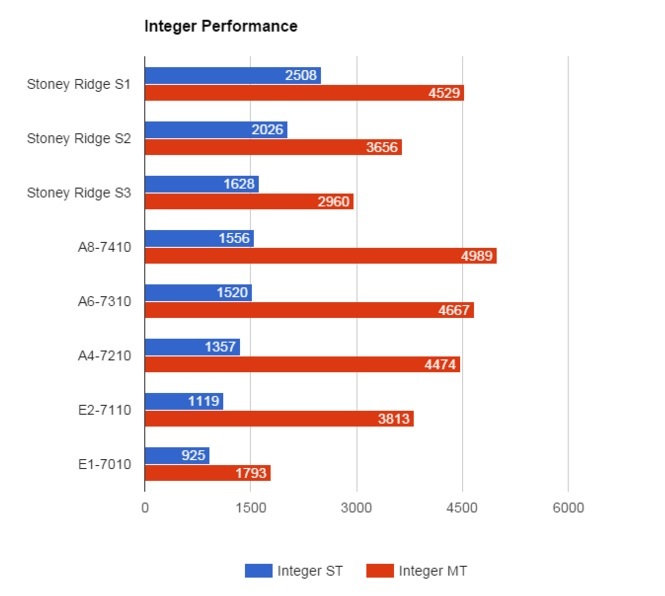 In single threaded integer performance, Stoney Ridge (S3) comes out on top. Closely followed by the Pentium 4405Y. Both are much faster than all other APUs/CPUs. The Atoms are much slower and the E1 is dead last. In multi-threaded integer performance we see a sharp reversal in favour of the Atoms. Thanks mainly to the quad core design. 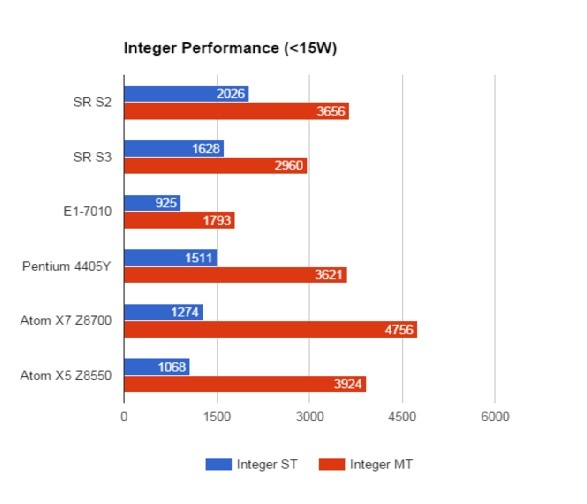 The fastest Atom (X7 Z8700) is 60% and 31% faster than Stoney Ridge S3 and Pentium 4405Y, respectively. The E1 finishes last, in a league of its own. 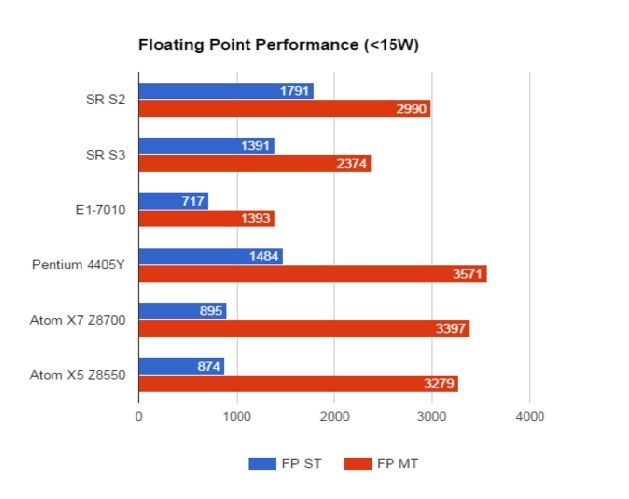 In multi-threaded fp we see the Pentium 4405Y and the Atoms X7 and X5 move to the top three places, with the Stoney Ridge S3 remains in a distant 4th place. Stoney Ridge has several advantages over Carrizo-L when it comes to graphics. First, Stoney has 50% more CUs (3 instead of 2), and even though it comes with lower clocks than Carrizo-L, the overall result should be a net positive, also, the CUs in Stoney Ridge should sport the new color compression features of GCN1.3+, which, along with the expected bandwidth increase from moving to DDR4L 1866 instead of DDR3L 1600 should provide a much better utilization of the graphics resources compared to Carrizo-L. Stoney is expected to deliver somewhere between 5% and 50% over the top end Carrizo-L, depending on game. Generally, Carrizo-L was pretty evenly matched with intel GT1 graphics, both provided basic performance for playing light and older titles at low resolutions. Stoney Ridge will not be a radical departure from that position. It will offer a better experience, but still within the same light gaming capability. The Stoney Ridge will be AMD’s tool in the low end of the market against intel’s offerings. For the first time though, we see a reversal of design philosophy between the two camps. With AMD shooting for higher single threaded performance and intel, at least with the Atom line, is going for multi-threaded performance using higher core counts. Stoney Ridge offers chart topping single threaded performance, which in a light threaded scenario that is typical of this class of machines will deliver a very snappy experience. In face, Stoney’s single threaded performance matches or exceeds that of the best high end 15W Carrizo offering from AMD. For multi-threaded tasks things are rather different. While it delivers solid performance in multi-threaded Integer tasks, Stoney’s multi-threaded FP performance cannot be described as such. For gaming and multimedia it should provide a healthy improvement over what’s currently in the market, but it won’t be breaking any new ground. Regarding the <15W offerings, the same arguments apply, though it remains to be seen at what TDP the second sample will be released. Since it will be a very competitive part if it sports a <15W TDP. All in all the Stoney Ridge is a platform that should offer a very good user experience at this segment and the best single threaded performance (what matters for web, office and general light usage). Along with improvements in multimedia and gaming. It is a nice package, that only needs to be put in the right systems. Let’s hope AMD is able to secure enough design wins, in the right form factors for Stoney Ridge.